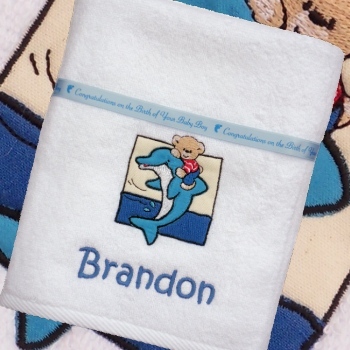 Personalised baby bath towel made from supersoft cotton which is perfect for newborns to toddlers with sensitive skin. Fine supersoft 100% terry cotton made for temperature control and maximum comfort for your little one. White lightweight supersoft towling measuring approximately 70 x 115cm (non hooded) rectangular baby bath towel. Fine supersoft 100% terry cotton made for temperature control and maximum comfort for your little one. White lightweight supersoft towling measuring approximately 70 x 115cm (non hooded) rectangular baby bath towel. Features an adorable teddy bear riding a dolphin applique embroidered motif and also personalised with an embroidered name or initials of your choice. Add a Personalised Ribbon: Select the option to add a personalised printed satin ribbon to be tied around this shawl for presentation (small fee applies). The ribbon will be suited to the embroidery. The ribbon can indicate who the gift is to and from, or a little message such as Happy Birthday! Type in your wording for the printed ribbon in the text box. Personalised gifts are specially made to order by Amys Gifts, Please allow at least 48 hours for us to complete your order.